No… They’re not dancing. The above figure illustrates technique of locking and breaking opponent’s spinal cord. Please don’t try this with your friends as it is lethal. To me, there is only one type of self-defense technique: the method of bringing down our opponent in the shortest possible time and effort. Call it by any other names if you may: kung fu, boxing, silat, taekwando, karate etc. You are in your casual suits with a pair of tight jeans out for a walk and someone is confronting you. What would you do? If there is no way to run, then you must be prepared to defense yourself. The fact is: with today’s attire, there is very little chance to do fly kicks or any other kicking techniques as we can see from Jacky Chan’s movies. What is left is your pair of hands. Count yourself lucky if you have a pair of strong fists at least with a strong blow, you will knock the assailant out cold. But what happened if the opponent is too close for a punch, then we will need the ‘capturing technique’. If we know human anatomy pretty well, then we know where the weak points in our body are and use these weaknesses to our advantage. What is best distance to capture and break a person’s neck? The answer is only an inch or so… Believe it or not? Many people come to me wanting to change their not so good luck to super good luck. Many of these folks have practised some form of Thai, Taoist, Hikmah or even tantric rituals for years. But why those people haven’t been able to change their lucks even with dozens of Phra Ngan statues, endless Kumanthongs and even with the more powerful baby fetus in their altars? Well, time and again that I have pointed out that Asian people were once ancestor worshippers; and most of the Indochinese traditions still put ancestor worships as the first ritual at the beginning of the day. In the traditional practice of Javanese Asma Sungai Rajah (ASR) on the other hand, one must obtain the blessing of his/her mother and this is done by kissing the mother’s feet. The ASR will not work without the mother’s consent no matter how many counts of recitation one do. Similarly in Thai magic, the parents’ blessing couple with the blessing of one’s ancestors, his/her gurus, spirits, devatas and the Buddha will empower any rituals to be effective. Amongst all of the rituals, one ritual that will definitely change our luck is to wash our mothers’ feet. I supposed, it will work too if we wash our dad’s feet too. I did not make up this ritual. This ritual was taught to me when I return from Vietnam and reroute to Chiang Mai, Thailand to visit my long time no meet brother in dharma, Mr. Suracai. Suracai fetch me at the airport and after dinner, he brought me to see a senior monk who stayed in a small temple just outskirt of Chiang Mai. The temple also houses about 40 lonely senior citizens. When we arrived at the place, the old monk was washing an old granny’s feet. So, we waited patiently outside for the monk to complete his task. According to Suracai, the monk was once a powerful arjan when he was young. But now he rather spends time in teaching dharma and serving the person in need. After a while, the old monk came out to greet us and we returned the salutation. After I returned home, I tried the ritual and my luck is changing as if the clearing of rainy cloud. I thought the method to a few people, and my friend Mr. Tan said his business suddenly improved. So I publish the method and hopefully everyone benefits from washing his/her parents’ feet. 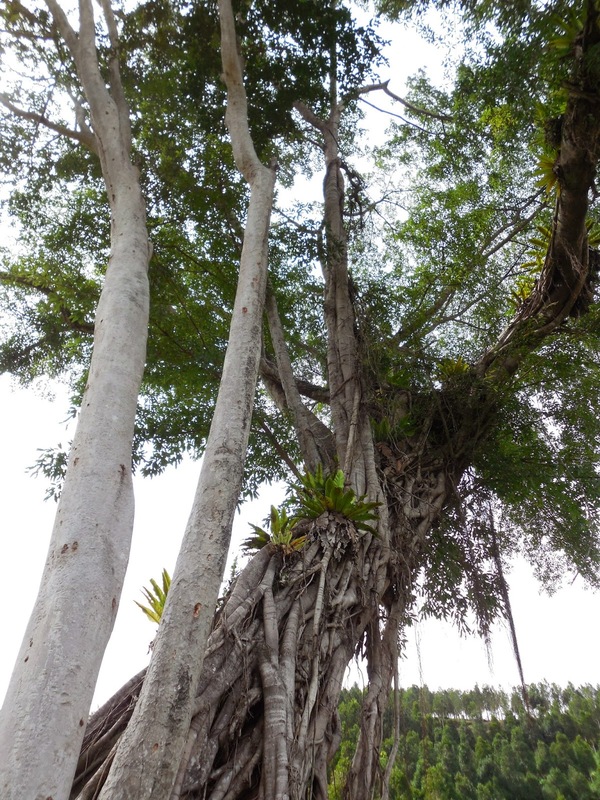 The cengal tree on left is the mother, the right is a banyan tree which is the father with the center tree as their child. There are always two bird nests at any single time. Believe it or not? I was visiting an agarwood plantation in Gopeng and my guide brought me to a pair of entangled trees. On one side, it is a rare Cengal Emas (Neobalanocarpus Heimii) and on the other a Banyan tree. Both trees seem to be hugging each other with another Cengal Emas growing erect between the two. According to my tour guide, the Cengal Emas was the emanation of a British lad, the Banyan tree an aboriginal lady while the central piece is their offspring. Story has it that the plantation management wanted to cut down the trees in the beginning of agarwood planting phase but whatever they tried, the machineries would fail at the very beginning… First, the bulldozers won’t start and the chainsaw failed on touching the tree trunk. About a decade ago, a young and handsome British lad fell in love with an aborigine girl and they wanted to get married. However, their sweet dream was opposed by the youth’s parents and they lodge a complaint to the British authority at that time. The British acted according and sent in trooper to arrest the aborigine girl. The couple was very scared on learning of the arrival of the army and didn’t know what to do. Finally they came to the current location and made a prayer to the mountain god. After some prayer, the mountain god manifested in front of the couple and told them that if they truly love each other and that they wanted to stay with each other until the end of the world; then the mountain god can turn them into a pair of boulders or trees of their choice. After some pondering, the couple decided to become trees and the mountain god thus turned the lady and lad into two huge trees which stayed put until these days. 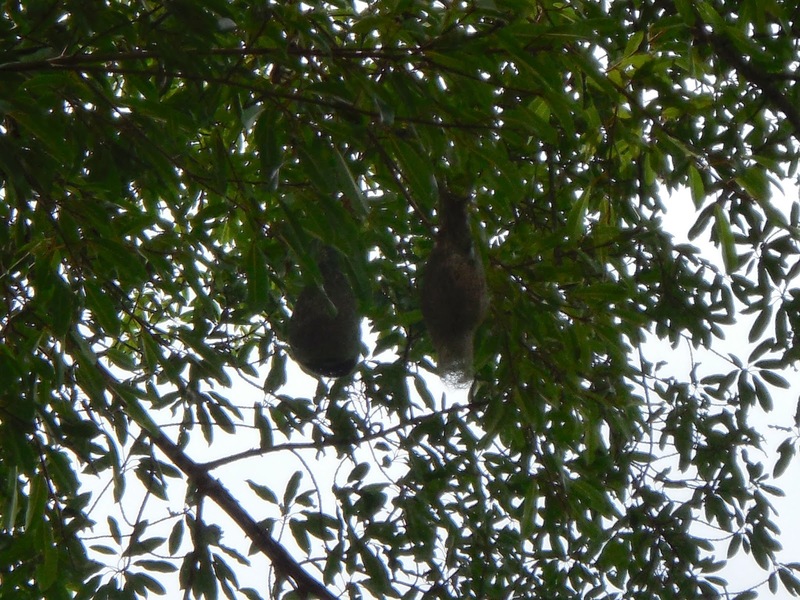 I am in no position to say if the above story is true, but the guide told me that birds normally build nests in pairs as shown in picture 2. If you have the time, why not come to Gopeng to see the lover trees with your own eyes and make a wish too! Taiji is more than just martial arts. Many people practise Taiji boxing as a form of slow exercise; only a handful few learnt Taiji sparing techniques for self defence purpose. The former has now evolved towards performing arts or dance (舞蹈) while the later is not too impressive (无看头) to look at and slowly forgotten in time. The practice of human to human is the man to man combat or otherwise known as “push hands” (推手). The basic idea behind it is very simple: to make the opponent lose balance and hence to capture (擒拿手) or to harm him/she. Hence in actual situation, Taiji is quite a deadly art and it involves the training of fingers strengths. The basic idea is simple: one must be able to feel the source of an opponent’s strength (听劲), lock it and use his/her own power against him/her. The fundamental principle of Taiji is neither let go nor opposes (不丢不顶); so when the opponent made a mistake, he/she will be thrown off balance. Now, let’s move on as it is getting too technical and boring. Everyone knows that Taiji is based on Yin (阴) and Yang (阳). So, one must understand where he/she stands against his/her opponent. A stronger opponent is Yang, and a weaker one is Yin. Similarly, a plant and spirit belong to Yin. Some animals are Yin while others are Yang type. The celestial bodies such as the sun, moon and stars are Yang while the earth is Yin. Only after we know where we stand that we may start sending energy to, or receive energy from the target. For example, if we want to feel the energy of a tree, then we can first send our energy and then retrieve the energy from the tree hence making a complete energy exchange. We may choose to stop the energy or collect it and then release back to the tree. Likewise we may go to a tomb and perform the same exercise, but the danger in doing these exercises is that if the opponent is stronger, it may steal our energy instead. So, please don’t venture into the woods or cemetery first without permission; and second, without any supervision. If you feel sad or down for some reason, then you can perform the congregation of energy exercise as above. Imagine that you are holding an invisible ball and turn it clockwise and in circular motion. The energy ball may grow and when you feel you have had enough, let the energy ball go with a shout. I guarantee that you will feel lighter as if unloading a heavy burden. O, do the exercise in an open area such as a garden please. The “men in black” here doesn’t refer to the movie “men in black”. I don’t know of the origin of these men in black but they seem to lead the soul of a dying person to somewhere. I have personally dreamed of a man in black led me to a garden full of pink flowers. My late dad did tell me about a dream a couple of months before he passed away. In the dream, a man in black brought him out of our house and walked nonstop until they reached a small one trunk wooden bridge (独木桥). Since the bridge was too narrow for two persons, the man in black walked first. As soon as he passed the bridge, the wooden bridge suddenly broke into two and collapsed into the river. My late dad couldn’t cross the river; hence he returned home and subsequently told his story. Another story was told by a blog reader, know as QQ. According to QQ her father was in comma and hospitalized for a week or so. The doctor told QQ that her dad was in critical stage and asked her to be mentally prepared. As Nancy was yelling, she hastened to the other corner of the sickbed and perform a seemingly tug of war action with ‘something’. Everyone was startled by the little girl’s action and before QQ managed to catch hold of little Nancy, the commotion ended. Everyone thought it was the little girl’s vivid imagination and soon forgot about the incident. A few days later, QQ’s father who was unconscious shown signs of recovery. And another week later, he was fully conscious and being discharged. Even the doctor was surprised of the old man’s amazing recovery. “I could see myself lying in bed on that day you and Nancy came to see me. There were two men in black appearing from nowhere dragging me away from the bed. All of a sudden little Nancy pulled my left hand and started to make noise. After some resistance the men gave up and went to the uncle lying in the adjacent bed. QQ said that maybe young children have sixth sense to see the men in black; and we just guessed that the men are messengers from hell. What say you? O spell of life and death! Thou art the charm of creation. · It opens a portal to spiritual realm. · It invokes serpent energy which can be seen in the midst of night as a grayish silver fog for the spiritual sensitive ones. Legend has it that the Druids in ancient time were known to be able to call mists to help them to defeat the Romans. It was also said that a person who has tried the above charm was physically dragged into the reptilian world and never to return in early 1990. Hence, my advice is not to try it; or try at your own risks. Whenever I talk about bear, some old time stories will resurface in my mind. To tell you the truth, the bear influenced my younger days a lot and later when I studied Thai magic at a later time. My Lanna master gave me a bear tooth said to be from Cambodia for protection and I supposed I am somewhat link to this creature. You may say that the bear is my totem animal too. My leklai stones like honey, so do the bears. You know, the best time in rubber plantation then was during durian seasons. My pa, my bro and I like to venture to the edge of jungle to collect durians which fell during the night. Once when we approached a tall durian tree, we heard a loud noise indicating some heavy object has fallen from the tree. Everyone call out almost spontaneously: “durian jatuh!” (durian has fallen!) And without too much hesitation, we ran to the location of the sound but after searching in the vicinity; we just couldn’t find any durians. “It’s the bear! Not durian!” Pa suddenly shouted. Apparently bears can climb trees but when they want to descend the tree; they will take a ‘free fall’ approach and hence the big ‘thumb’ sound that we heard. It is strange but true. It was during season again, pa decided to build a small hut to watch over the durian trees overnight. So I helped him to do his project and the work completed at dusk. As I didn't have the gust to spend a night in the jungle, I decided to venture back alone on pa's old bicycle. There were two routes that I could take: the first which is shorter but I would need to go pass a two miles swampy area and a narrow wooden bridge. The scariest part was that the locals said there was a white tiger watching over the area. Someone even said that he has seen the manifestation of a headless ghost! The second route is that I must pass through an old spooky cemetery. The cemetery wasn’t very well tended and some part of it was eroded exposing human remains. In the mist of passing the cemetery, the day darkened and the temperature dropped quickly. So, I decided singing out loud to drive away my fear and I did. Just as I was singing the first lyric; I immediately regretted my stupidity and thought best just to keep my big mouth shut. A bear suddenly rushed out from nowhere perhaps startled by my cacophony and rammed into myself. I subsequently tumbled into a bush at the roadside together with my bike. As I was so afraid that the bear would harm me or something, I immediately stand up and ran forward with all my strengths until I fell onto the path due to exhaustion. As I was sitting helplessly pondering if I should return to get my pa’s bike; an acquainted old Malay Haji slowly pushing the bike walking towards me with some durians. I immediately thanked the kind Haji and told him my ordeals. The Haji gave me the bike and I hastily return home without the courage of looking back… or sing. Perhaps the bear spirit has tortured me enough, it finally gave me a tooth for protection through my guru. At least, I still live to tell you my side of the stories. My grandparents were rubber tappers who for the most of the time stayed in a rubber plantation near the Kuala Kangsar railway station. My pa too was tapping rubbers when he was young. Rubber tapers normally start working at around 5a.m. So they need to wake up at around 4am or earlier. For few occasions during school holidays, I did follow my late pa to tap rubbers too. Sometimes I go alone when my pa was busy with other works. For a few times at the same location, I would see a strange fire ball and at times three moving from tree tops to the roots, plying up and down and then vanished into thin air. After I told my grandma my encounters, she set up a Datuk shrine at the location where I saw fire balls and I have not see any reoccurrences since. I can still remember that once during durian season, my brother and I borrowed grandpa’s old motorbike to go to the edge of virgin jungle at the midst of the night to collect durians. When we arrived at the destination, we saw someone has left a pile of nice big durians with a machete lying beside. It was quite strange to say the least if anyone would be so clumsy to leave those things behind as that would mean wasting a hard night’s work for nothing. So without hesitation we bagged the durians and took the machete and call it a day effortlessly. However, in the afternoon when we were enjoying the durians; news came to us: Our Indian neighbour, Muthu has gone sick after returning from his durian collection trip last night. The news has it that Muthu has seen some fire balls lingering on top his head and due to extreme fear that he flee the place leaving all his harvest and even his beloved machete! I have kept the secret for many years until now. I seldom see these bizarre fire balls now days. Some people also call them ghostly fire balls (鬼火) which are quite different from orbs. Ghostly fire balls normally appear in the form of flames such as that of a candle flame while orbs are normally round. Have you ever seen any ghostly fire balls? When Ngai spirit is no longer wanted, instead of throw it away; the owner can married it to a third party. This can be done in two ways. If the Ngai is to be passed on to another person to continue with fostering Ngai, then the rhizome is wrapped with a piece of red cloth and the package is handled to the person who is normally a disciple or the person’s offspring. If no one wanted to inherit the Ngai, then the rhizome should be boiled and then dried under hot sun for three days. This is to bind the Ngai spirit to the rhizome and not escape to elsewhere. After that, the dried rhizome is wrapped with a piece of red cloth together with some money. Instead of giving the package to a person, it is placed beside a road and whoever picks the package up is deemed to accept the Ngai voluntarily; like it or not. This incident happened in the 1940’s in the village where my master stayed. A poor farmer picked up a parcel on his way home after a hard day’s work in his rice field. When the farmer opened up the parcel, it was a dried ginger rhizome and some money. The farmer knew that someone wanted to get rid of Ngai spirit and that he shouldn’t keep the money; but the temptation was too much and that he wanted some money to feed his family. So, after taking the money, the farmer decided to lose the Ngai by swimming across a river parallel to the path. It is said an Ngai spirit cannot cross body of waters. However, the farmer did not know that the Ngai has already attached itself on his hat when he started to cross the river. Luck was on the farmer’s side as his hat was washed away by strong river flow in the midst of crossing the river. Someone picked up the farmer’s hat somewhere down the stream and hang it on a tree branch at the river bank. The tree subsequently withered and died. The farmer told his son the story behind it. It was pretty unlucky that the Ngai spirit was still attached to the tree and when it heard the farmer’s tale, it immediately knew that the farmer was the person it has been searching for. The Ngai didn’t waste any time and swiftly attached itself onto the farmer. On returning home, the farmer was fallen sick and started to waste away. People said that the Ngai has consumed his soul. The below spell came with this keris pusaka. ‘Keris pusaka’ is a term used to describe heirloom keris and that keris is a type of short dagger or sword once used as a weapon. There are many keris collectors around the world especially in Indonesia, Malaysia, Netherlands etc. Below magic rite was described to me when I took over a very special Javanese keris from my friend’s stepmother some time ago. I have not personally tried this ritual but I think it is applicable to other similar objects such as a ritual knife, a parang or a sword made of iron. First and foremost, this magic is a little eerie but I supposed the purpose of it is to reduce mental stress caused by someone wanting to seek revenge due to unjust done on him or her; but due to the prohibition of secular law or physical inability. Anyone who wanted to try this spell must first get hold of a keris pusaka or anything along the line. After that, he/she must get a piece of his/her opponent’s photo and write the person’s name and date of birth. If a photo is unavailable, then it is possible to draw the target’s figure on a piece of yellow paper. After the personal particular is written, then the photo/paper should be attached onto a wall in the bedroom and the weapon should be put right under the photo/paper at midnight. After reciting the incantation a few rounds detach the photo/paper and attach it on to the area where you want the keris to harm. Go to sleep and you will be dreaming of tracking your enemy, subsequently catch hold of him/her, and stab the person to death. The success indicator of this spell is that the spell caster will be awakening by his or her own laughter as if in tremendous joy. The above spell might sound cruel and that it may be just a dream; I wouldn’t want to encourage it. What difference would it make if it doesn’t work? Even if the spell did work, then it will be very bad karma and the debt will need to be repaid in coming years though not in the court of law. Know the magic as it is part of our Nusantara heritage and that’s all to my intention of publishing this spell for your reading pleasure. There are many methods to balance one’s aura. One can perform the traditional chakra balancing techniques of Kundalini Yoga if he or she so wish desires; or one can use the ‘herbalist’s tree balancing method’. Basically in old herbalist’s view, our emotions and the well beings of our physical body are pretty much affected by the external world: Our working environment, our colleagues, people that we come into contact daily and seasons of the year affect the conditions of aura. Our aura can be contaminated by parasitic entities, negative or positive energies; whatever case it may be. If these foreign energies are not grounded at the end of the day, our emotions and subsequently our health will be affected. And that’s the reason why people in professions such as doctor, teacher, masseurs, social workers etc. tend to suffer from serious illness years later. · Move the chi (气) to a point about 3 inches below navel called ‘dantian’ (丹田) and meditate for a few minutes. · Now lead the chi into the kidneys and see if kidneys are okay. Move on to liver, heart, spleen, lungs and finally back to dantian again. · If any of the organs are weak, then we will need to rebalance those organs one at a time. Now the person must stand in front of the tree touching the tree trunk with both palms. With some practise the person should feel a flow of energy entering his/her body through the palms and then out of the body from the palm. Let it be until the energy flow stopped. This may take 10 to 45 minutes depending to the condition of the organ. Don’t forget to give thanks for the tree before leaving the place. If there are more organs to balance, then come another day to other trees. Please don’t perform this exercise repeatedly to the same tree or the tree may die because it takes time for the tree to purify the negative energies.